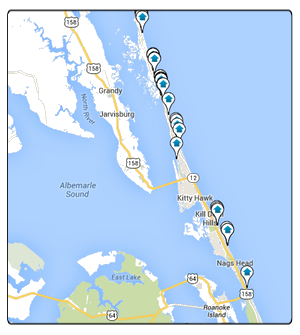 Just north of Kitty Hawk is the community of Southern Shores. Many of the residents there are vacationers but the west side of Kitty Hawk is made of up mainly year round residents. There is private beach access and parking and this limits access to the beach to only those who live or rent there. Southern Shores has not been commercially developed and there aren't many shops nearby but this just adds to he natural beauty and the peace and quiet!